When you hear the words cookie bouquet, does your mind travel to bright colored flowers, birthday themed balloons, or maybe even adorable pink rattles? People usually move to the cute area when talking about sending cookies to their loved ones for a special event. Last year, a client ordered a Day of the Dead cookie set to send for a birthday celebration. There were a lot of puzzled looks when I showed people the picture. “For a birthday?” they asked. Day of the Dead was her favorite thing so of course it made a wonderful bouquet. It also sparked an idea. Why must the bouquets look sweet? Shouldn’t they tell you more about who they’re going to? This thought happened to coincide with seeing interesting art pieces popping up on Facebook. They’re everyday items themed after some of your favorite heroes and villains. One of the most interesting pieces was a coffee table fashioned like Jason from Friday the 13th. I thought if you could make the gruesome a casual conversation piece in your living room, why couldn’t you make it a cookie? And my idea was born for the perfect birthday themed cookie bouquet. I know I won’t be sending my mother the blood splattered cakes for her birthday, but I do love them. Really, I love everything about this set. They’re the perfect combination of capturing the character in a friendly way. 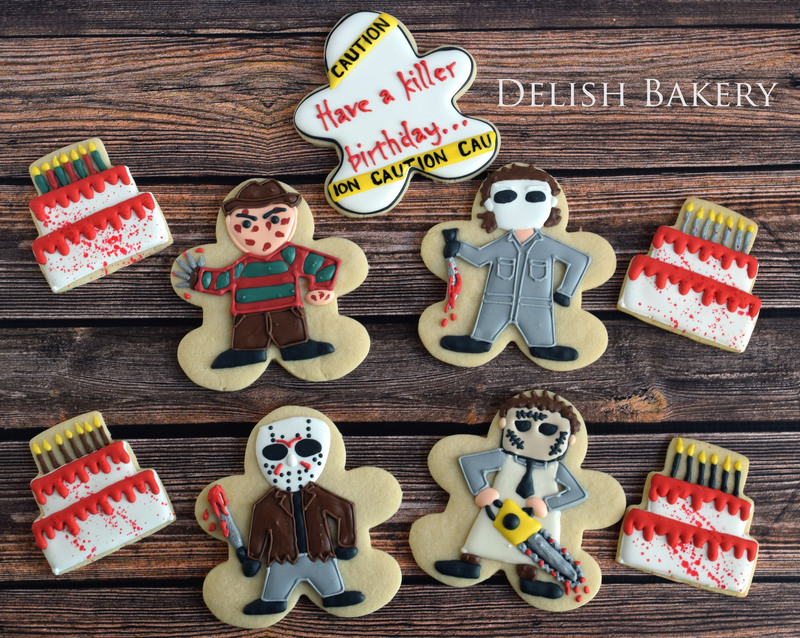 This could be the perfect gift for the horror fan in your life. What do you think? Could you eat a killer?